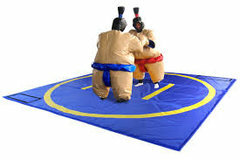 A great addition to your next company picnic, school festival, birthday party, or any other type of celebration, our Sumo Suits Rental is a classic party attraction that lets two players battle it out in heavily padded sumo suits! Suitable for ages 7 and up, the Sumo Suits come in a one-size-fits-all configuration and include accompanying headgear, as well as a large mat that serves as the sparring ring! Can you push your opponent out of the ring before they get the best of you? Only one way to find out! Make your reservation today, and be sure to reach out if you have any additional questions!